KANSAS CITY, Kan. -- As far as I'm concerned, it's high time Kyle Busch grabbed a shotgun and took off after Richard Childress. On a hunting trip. Go to Montana with him. Or Wyoming. Or some remote land maps don't chronicle and nobody's ever seen outside of Childress, Dale Earnhardt and the locals. That's the only way this feud will truly be quelled. They need to hash it out over cold beers and wet fishing line. With that comes honesty. And, ultimately, laughter. On Saturday, witnesses said Childress removed his wristwatch, snatched up Busch in a headlock and went to beatin' on his head with his fist. There is neither footage nor photographs of the incident, at least that I am aware of. But I imagine it looked something like Nolan Ryan versus Robin Ventura. 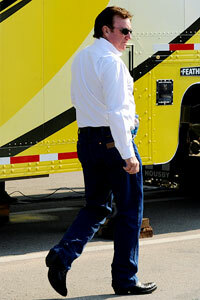 John Harrelson/Getty Images Richard Childress leaves the NASCAR hauler after meeting with officials prior to Sunday's Cup race at Kansas Speedway. Whether it looked like it or not, we'll likely never know. But we do know this: The message was the same. Don't tread on me, young buck. This is my territory, and I'll see to it myself that you respect that territory. As it pertains to racing, Busch did nothing wrong during -- or after -- Saturday's Truck series race at Kansas Speedway. Yes, he raced inexperienced drivers very hard -- too hard if you ask around the Cup garage. But this is Kyle Busch. If it has wheels, he's going to drive it like Junior Johnson running from the revenuers on the backroads of Wilkes County at dusk. We know that. It's not surprising. During the race, Busch leaned on and crowded some kids who aren't prepared to be leaned on or crowded, including Joey Coulter, driver of Childress' No. 22 Chevrolet. He tapped Coulter after the checkers. That is driver code for, 'Hey, brother, I see you. I'm right here. And I don't like what you did to me.' It happens every weekend at every racetrack in this land. The difference is this isn't Sprint Cup. Coulter has eight Truck series starts to his name. He's learning on the fly. And he was racing the best of the best for a top-5 position. Welcome to the big show, kid. Coulter said after the race his truck began to handle differently than he expected. It got tight, so the front end wouldn't turn, and he pushed up into Busch's truck. Coulter ultimately prevailed in the drag race to the checkers, finishing fifth to Busch's sixth. No matter the reasoning, Busch was none too pleased with the outcome and showed it with the love tap. And that set Childress off. He would not be denied. He would prove to Busch once and for all that damaging his cars for no good reason would no longer be tolerated. This goes way back, even before Darlington or Dover. Multiple sources inside Richard Childress Racing tell me that there was a time years back, when Busch and RCR's drivers were wrecking far too many cars unnecessarily. That equals countless man hours to fix them. And that equals money spent. So Childress confronted Busch, and told him if it continued he'd settle the situation himself. Saturday, it seems, he lived up to his word. Childress hasn't commented on the matter, and Busch has said little more than yes, it happened, and that he'll support whatever action NASCAR deems appropriate. At this time he doesn't plan legal action outside of NASCAR's decision. NASCAR said Sunday that Childress' actions were "unacceptable" for a team owner and "will not be tolerated." The sanctioning body will announce its findings this week, and I'll be very surprised if they suspend Childress. I base that opinion on his stature in the sport and the lofty respect NASCAR officials have for him. I could be wrong, but I expect he'll be fined monetarily, and that will be that. What he did wasn't right. It's the old-school approach. It's the way it used to be handled. It's not how it should have been handled this time. They should grab a couple of shotguns instead. And go hunting together. Marty Smith, a former senior writer for NASCAR.com, became an analyst for ESPN and ABC's coverage of NASCAR in 2007. Smith had been a regular contributor on ESPNEWS, "Cold Pizza" and SPEED News, offering energetic and vibrant commentary, since 2005. In a short career, Smith has become one of the most well-respected writers in the field, and his contacts in the NASCAR garage have led to many breaking stories. As an Insider, Smith reports on the latest news and information behind the scenes and breaking stories on teams, drivers, owners and crew chiefs. He serves several of ESPN's multimedia platforms, reporting for "NASCAR Now," "NASCAR Countdown," ESPN Radio, ESPNEWS and "SportsCenter," as well as providing weekly content on ESPN.com. Before joining ESPN, Smith was a NASCAR analyst on Fox Sports Net, providing insight into the industry's hottest topics on programs "Around the Track" and "Around the South" from 2005 to 2006. In those same years, Smith hosted Speed Channel's "Back Seat Drivers" and was a guest analyst on "NASCAR Nation." A 1998 Radford University media studies graduate, Smith joined The Roanoke (Va.) Times newsroom during his senior year at RU, where he covered a variety of sporting events. Later that year, he moved to The (Lynchburg, Va.) News & Advance, where he conducted an interview with Lynchburg native Paul Brooks, vice president of NASCAR, that ultimately changed the course of Smith's career. Shortly after, Brooks hired Smith for NASCAR's public relations team in Charlotte, where he provided online content for the NASCAR-owned league Web site from 1999 to 2000.